Another blueberry recipe and that's it... for now! 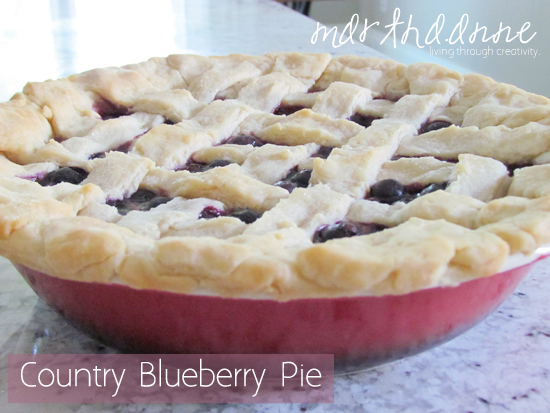 Last week I shared the Blueberry Cream Cheese Pie Recipe with you... what I would like to call a more modern dessert. 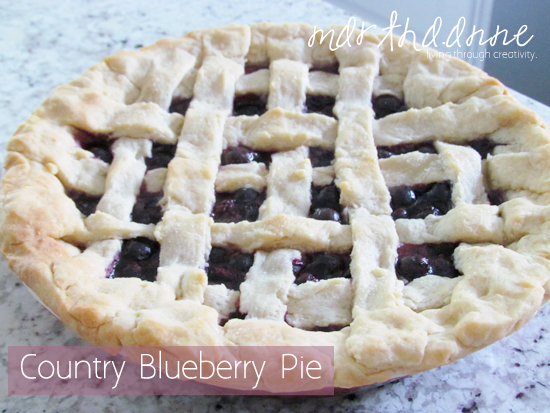 The hubs prefers the good old fashioned ones better, so this week it's a Country Blueberry Pie - Yum! It came out a little juicy, but delicious none the less! I'll quit the talking and get straight to the good stuff - the recipe. 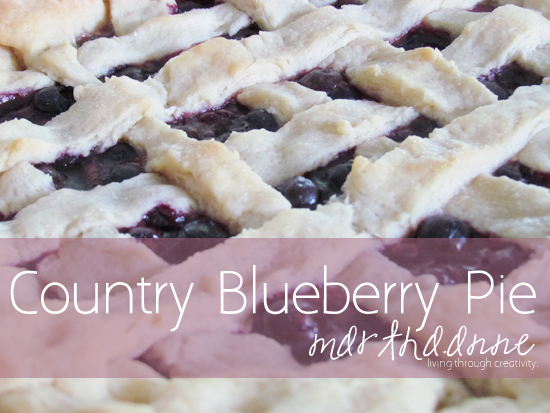 I took the filling from here and made my simple pie crust instead. Preheat the oven to 425ºF. Combine sugar, cornstarch, cinnamon and water. Add to a saucepan and heat rapidly until thickened. Set aside to cool as you prepare the pastry. Once cooled add the berries and lemon juice. While that cools, let's create the pastry. Mix the flour and margarine until it is crumbly. In a separate bowl, mix egg yolk and milk and then add to flour mix. Stir until the dough peels away from the sides of the bowl. Separate it in two parts and roll out. Press half of it into a pie pan and create strips with the other half for later. To finish, pour filling into dough lined pie pan, and sprinkle the lemon juice over the filling. Lay strips of pastry across the top to create a top crust. Sprinkle top lightly with sugar. Place pie onto a baking sheet and into the oven for 20 minutes. Reduce heat to 350 degrees F and bake for an additional 20 to 25 minutes. Allow to cool, cut and enjoy! I'm now out of blueberry desserts - and not that I want to say it... but it will be pumpkin season soon anyways! I love fall and can't wait and I also can't wait to make the most delicious pumpkin cake recipe known to man! I swear... the husband begs for it every year and it has been a huge hit at Thanksgiving Dinner! In the meantime, I will definitely post nursery progress pics soon! I'll be sure to hide all of the clothes I've been buying so you can't tell what we're heaving - I have become slightly obsessed with Baby Gap these past few days! As well, we have picked up and been given some pretty awesome things lately - our family is awesome and so generous!! Oh I am getting so excited... and I promise to share some progress... I'll be working away on it this weekend or maybe the dresser... I have to do something!! Anyways - have a great weekend out there.